Do not remove or disassemble parts unless instructed. Put a вЂњCAUTION: FLAMMABLEвЂќ sign in the workshop. Disconnect quick connector with the following procedure. Disconnect fuel feed tube (1) from fuel tube (3). There is no fuel return path. Remove quick connector cap (engine side) (2) from quick connector connection. 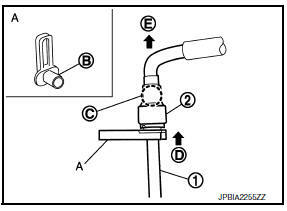 With the sleeve (B) side of Tool (A) facing quick connector, install Tool (A) onto fuel tube. Insert Tool (A) into quick connector (2) until sleeve (B) contacts and goes no further. Hold quick connector release on that position (C). Inserting quick connector release hard will not disconnect quick connector. Hold quick connector release where it contacts and goes no further. Draw and pull out quick connector straight from fuel tube (1). Pull quick connector (E) holding position (C). To keep the connecting portion clean and to avoid damage and foreign materials, cover them completely with plastic bags, etc. (A) or something similar. Disconnect harness connector from fuel injector. Loosen fuel tube bracket nuts and end bolts and remove fuel tube brackets. Remove fuel tube and fuel injector assembly. Loosen bolts in the reverse order as shown. When removing, be careful to avoid any interference with fuel injector. Use a shop cloth to absorb any fuel leaks from fuel tube. 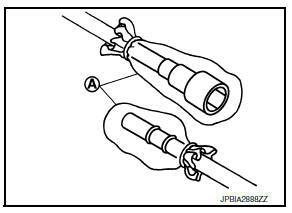 Remove fuel injector (3) from fuel tube (1) by pulling straight. Be careful with remaining fuel that may leak from fuel tube. Be careful not to damage fuel injector nozzle during removal. Do not bump or drop fuel injector. Do not disassemble fuel injector. Install O-rings to fuel injector. Handle O-ring with bare hands. Do not wear gloves. Lubricate O-ring with new engine oil. Do not clean O-ring with solvent. Check that O-ring and its mating part are free of foreign material. When installing O-ring, be careful not to scratch it with tool or fingernails. Also be careful not to twist or stretch O-ring. If O-ring is stretched while installing, do not insert it quickly into fuel tube. Insert O-ring straight onto fuel injector. Do not decenter or twist it. Insert clip (2) into clip mounting groove (F) on fuel injector (4). Insert clip so that protrusion (G) of fuel injector matches cutout (D) of clip. Do not reuse clip. Replace it with a new one. Insert fuel injector into fuel tube (1) with clip attached. Insert it while matching it to the axial center. Insert fuel injector so that protrusion (B) of fuel tube matches cut-out (C) of clip. Check that fuel tube flange (A) is securely locked in flange groove (E) on clip. 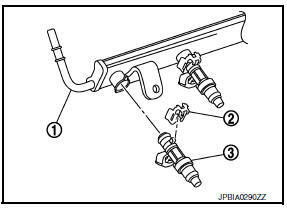 Check that installation is complete by checking that fuel injector does not rotate or come off. 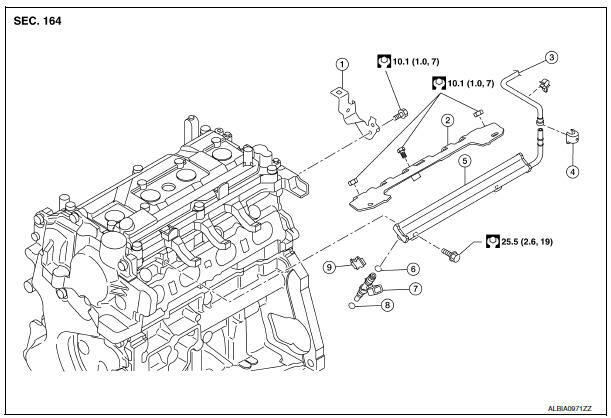 Set fuel tube and fuel injector assembly at its position for installation on cylinder head. For installation, be careful not to interfere with fuel injector nozzle. Install fuel tube and injector assembly onto cylinder head. Tighten bolts in the order as shown. Connect harness connector to fuel injector. Connect fuel feed tube with the following procedure. Check for damage or foreign material on the fuel tube and quick connector. Apply new engine oil lightly to area around the top of fuel tube. Align center to insert quick connector straightly into fuel tube. Insert quick connector (1) to fuel tube until the top spool (3) on fuel tube is inserted completely and the 2nd level spool (D) is positioned slightly below quick connector bottom end. Hold (A) position when inserting fuel tube into quick connector. Carefully align center to avoid inclined insertion to prevent damage to O-ring inside quick connector. Insert until you hear a вЂњclickвЂќ sound and actually feel the engagement. To avoid misidentification of engagement with a similar sound, be sure to perform the next step. Pull quick connector hard by hand holding position. Check it is completely engaged (connected) so that it does not come out from fuel tube. Install quick connector cap (engine side) (2) to quick connector connection. Install quick connector cap (engine side) with the side arrow facing quick connector side (fuel feed tube side). Check that the quick connector and fuel tube are securely engaged with the quick connector cap (engine side) mounting groove. 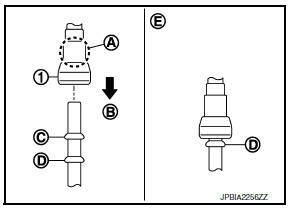 Quick connector may not be connected correctly if quick connector cap (engine side) cannot be installed easily. Remove the quick connector cap (engine side), and then check the connection of quick connector again. Install fuel feed hose to hose clamp. Turn ignition switch вЂњONвЂќ (with the engine stopped). With fuel pressure applied to fuel piping, check there are no fuel leaks at connection points. Refer to. Use mirrors for checking at points out of clear sight. Start the engine. With engine speed increased, check again that there are no fuel leaks at connection points. Perform procedures for вЂњThrottle Valve Closed Position LearningвЂќ after finishing repairs. Refer to EC- 139, "Description". If electric throttle control actuator is replaced, perform procedures for вЂњIdle Air Volume LearningвЂќ after finishing repairs. Refer to EC-140, "Description". Do not touch the engine immediately after stopping, as the engine becomes extremely hot.